Innovation, Nurture, Growth, Sustainability, Agility, Time Management, Teamwork, Talent, Dedication, Determination, Ubiquity etc. importance of the two concepts namely, Artificial Intelligence, Job Transformation, Job Attrition, etc. Technology’. He spoke about the need for Change Management and guided students as to how to be successful in the era of Digital Technology. and Digitalization’. He spoke about the need and importance of Human Interaction in the world of Digitalization. Service Attack, Artificial Intelligence, Big Data Analysis, Autonomous Cars. 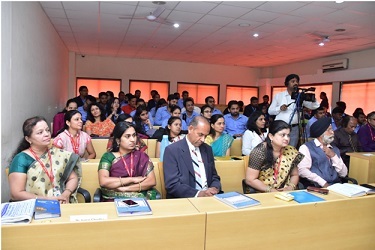 faculties of Suryadatta Group of Institutes attended the workshop. “Capital Market Awareness & Investor Education Program” by Bombay Stock Exchange (BSE) & Lotus Knowlwealth (LKW) for MBA-I, MBA II & PGDM students on, Saturday, 23th September, 2017. 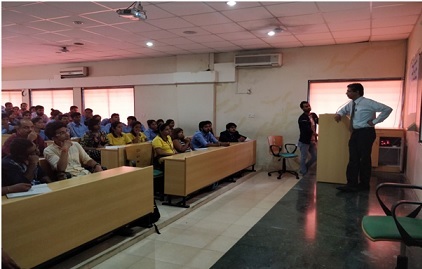 The Suryadatta Group of Institutes has organized and conducted a Workshop for all teaching staff members on “PEO’s, CEO’s and COs”. 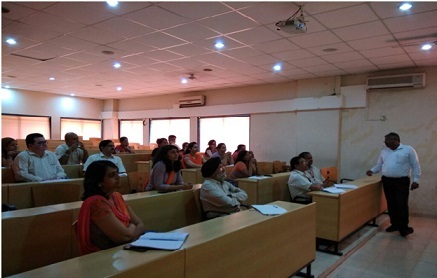 Workshop was conducted by Mr. R. K. Agarwal and assisted by Mr. Nimish Miglani, New Delhi. 24 staff members were present for the session. Mr. R. K. Agarwal has given information regarding PEO, CEO and CO in accreditation process of NAAC and NBA and its importance. He has taken practicals for each course for MBA and PGDM. 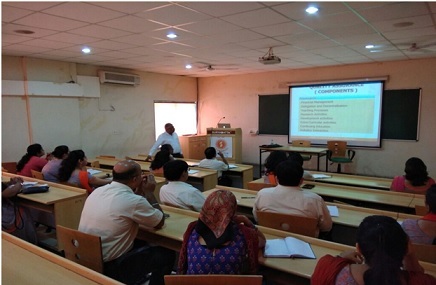 Faculty members participated and made PEO and CEO and Cos of their respective subjects. He emphasized on the quality process and its importance. The Suryadatta Group of Institutes has organized and conducted a Workshop for Teaching & Non teaching staff members on “Quality Excellence Through Accreditation” on Wednesday, 12th July 2017. Workshop was conducted by Mr. Nimish Miglani, New Delhi. 25 staff members were present for the session. Mr. Nimish Miglani has given information regarding accreditation process of NAAC and NBA and its importance. He emphasized on the quality process and its importance. Session was concluded by question & answer session where queries were asked by faculty members and Mr. Nimish Miglani has satisfied all queries with explanation & examples. 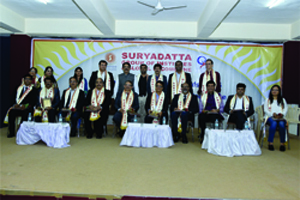 "Suryadatta Group Institutes and Global IT Commune jointly organized National IT Conference on 27th Feb 2016 at SGI Bavdhan, Pune"
One day workshop on ‘Power of Subconscious Mind’, held at SIMMC Navin Parekh motivates SIMMC students through his ‘Power of Subconscious Mind’, workshop The Suryadatta Institute of Management & Mass Communication (SIMMC) had organized an interesting and informative one day workshop on “Power of Subconscious Mind”, conducted by Sunil Parekh, an International Success Coach & Mind Power Expert, on 30th November, 2017. 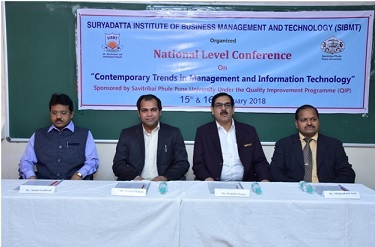 More than 100 participants including MBA-I, MBA II, PGDM students & all the faculties of Suryadatta Group of Institutes attended the workshop. 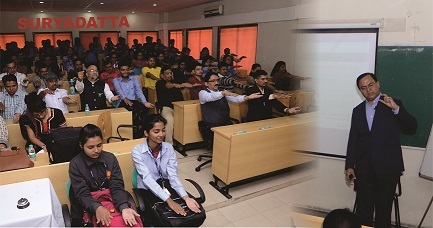 “The Mind Power Unlimited” session by Sunil Parekh was very helpful to the audience, to unleash the potential of their brain by tapping the power of the mind. “Human Brain is an immensely powerful machine, which is capable of processing huge & diversified information better and faster than any supercomputer would. However, it has been proved that human beings do not use their brain to its full potential and as they age the percentage of the brain they use keeps decreasing. Most of this is due to the domesticated lifestyle that we tend to lead where we seldom go around exploring the potential of the brain”, explained Parekh. During the workshop the participants learnt various innovative methods of handling problems by boosting the creativity. The participants also learnt various techniques to master the cutting-edge mind tools and technologies to overcome roadblocks, and for negotiations. Participants learnt various tools to stay focused, to connect with subconscious mind and to stay positive to attain the goal. The emphasis of the lecture was on the use of the power of subconscious mind to attain the goals one desire for one-self. 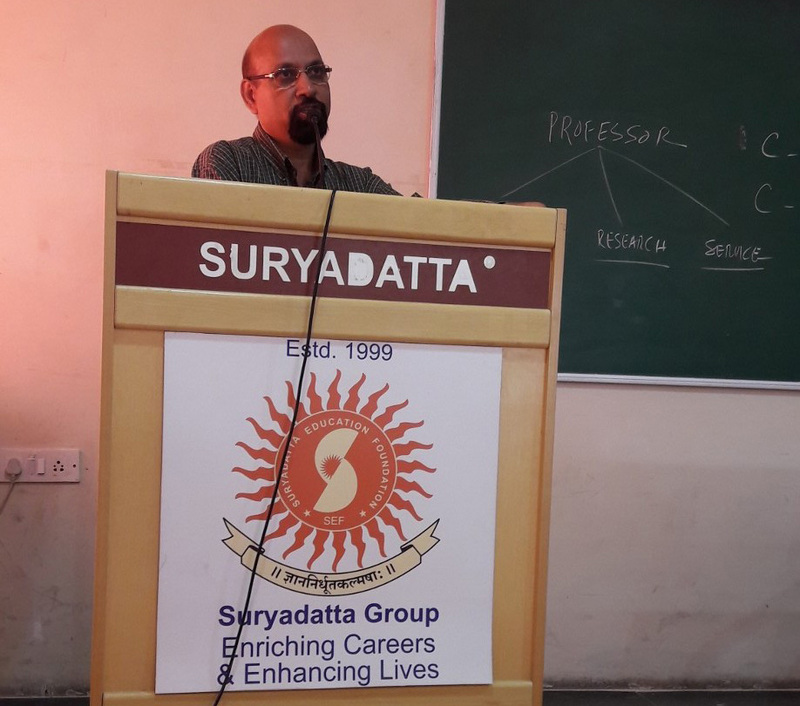 “Our institutes offer the best in terms of not just academics, state-of-art infrastructure, a sprawling campus to our students, but we also pay attention to their holistic development”, says Prof. Dr. Sanjay Chordiya, Chairperson, Suryadatta Group of Institutes.